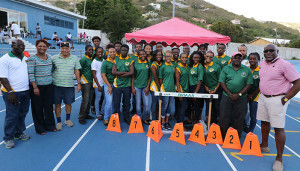 Some 40 years after making its first trek to the Carifta Games in Nassau, Bahamas in 1976, during a media briefing on Monday, the BVI Athletics Association officially announced a team of 21 athletes to represent the territory at the 45th Carifta Games in St. Georges, Grenada over the Easter Weekend. Competition starts on Saturday morning and runs through Monday night. The bulk of the delegation which is home based, will depart the territory on Thursday. Some 19 of the 21 athletes have recorded a personal best mark this season while five athletes have established six outdoor National Records and three have met IAAF World Jr. Championships qualifying standards. Samuels thanked the athletes for putting out their best and said when they get to Grenada the BVI will show the rest of the Caribbean, that they hail from the BVI and will always be a force to reckon with. “On behalf of the coaches I say thanks to the athletes and we will move forward with a positive and trustworthy goal to do great at the Carifta Games,” Samuels said. During Monday’s media briefing, the four members of the first Carrifta Games delegation from 1976, joined the 2016 delegation, to mark the 40thanniversary since the first group left the shores. Johnny Hassan who was president at the time, was joined by athletes Rose Phillips Adams, Ephraim Penn and Dean “The Sportsman” Greenaway. Also making up the first Carifta Games delegation were coach Theda Bucknor-Forbes and athlete Delores Barzey. The 2016 team is comprised of: U18 Girls: Beyonce DeFreitas, 200m; Arianna Hayde, Javelin Throw, Long Jump; Z’Niah Hutchinson, High Jump, Xiomara “Gia” Malone, High Jump: Judine Lacey, 400m, Shaniyah Caul, 400m and Akira Phillip, Javelin Throw. Boys: Djimon Gumbs, Shot Put and Discus Throw; Joshua Hill, 800m; Rackeel Jack, 400 and 800m; K’Cei Moses, 200 and 400m; Rikkoi Brathwaite, 100 and 200m. U20 Girls: Tarika Moses, 400 and 800m; Nelda Huggins, 100 and 200m; Britney Peters, Javelin Throw; Lakeisha Warner, 400m Hurdles & 800m; Deya Erickson, 100m Hurdles; L’T’Sha Fahie, 100 and 200m; Kiwanna Emmanuel, Discus Throw. Boys: Akeem Bradshaw Long and Triple Jump and Ronique Todman, 200 and 400m.